Aloha, Aloha -- It's Day #2 of the Hawaii-Themed Blog Hop, sponsored by the fantabulous Nicolette of Beyond Scrappin'. If you've come from Shannon's adorable Purple Lion Paper blog, you're on the right track. If you've happened upon here and want to start at the beginning, please do go to Nicolette's blog, and hang loose! This cute little boogie-boarder is none other than my granddaughter, Charlotte, enjoying her first summer! The way this little duck has taken to water, you'd think she was born in the summer, but noooooo.... she's December-born. 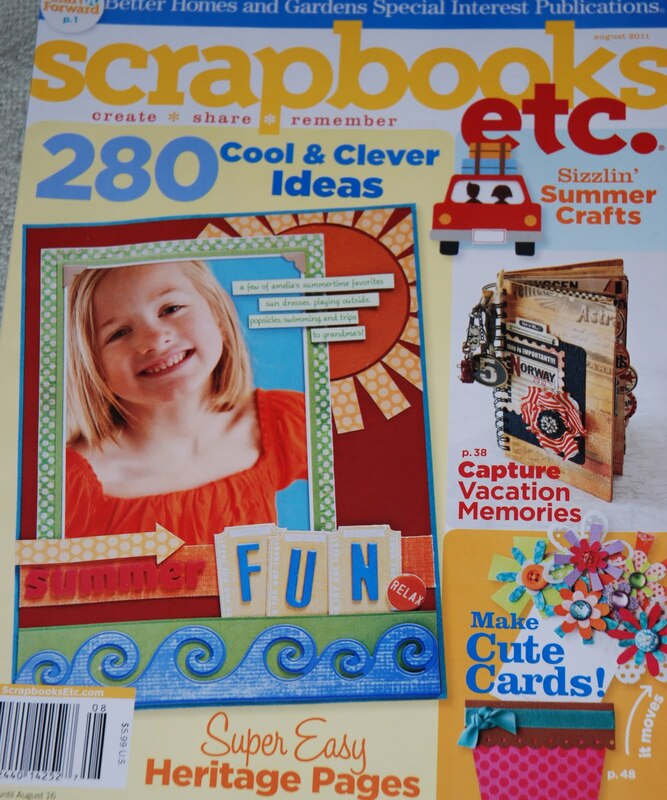 For this layout, I used Rusted Sun papers from Fancy Pants Designs, along with their matching Glitter Cuts. A few buttons on stickers marked "Sunglasses" and "Flip Flops", three floral brads, and this layout was done... Easy-peasy! So who doesn't like a little BLOG CANDY!? this Hawaiian Themed Blog Hop (today and/or yesterday's). 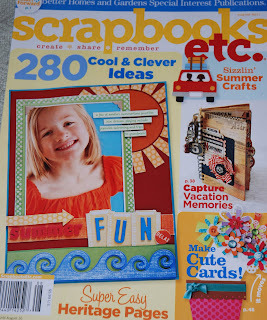 If you want to leave 2 comments -- one on each of the projects I made for this hop -- you'll have two chances to win this magazine chock-full of great ideas!! And you never know, I may throw in a super-surprise too! SO cute! Love those glittery waves as an accent! Cute layout of your granddaughter. My daughter learned to swim when she was very young and is like a fish. She is now a sophomore in college studying Art Animation. We moved here into her 1st apt (she stayed in dorm required 1st yr) last wk. Awesome projects!! Thanks so much for being in the hop!! What a cute layout and your granddaughter is adorable! Love the boogie board pic! I'm already a follower. TFS! 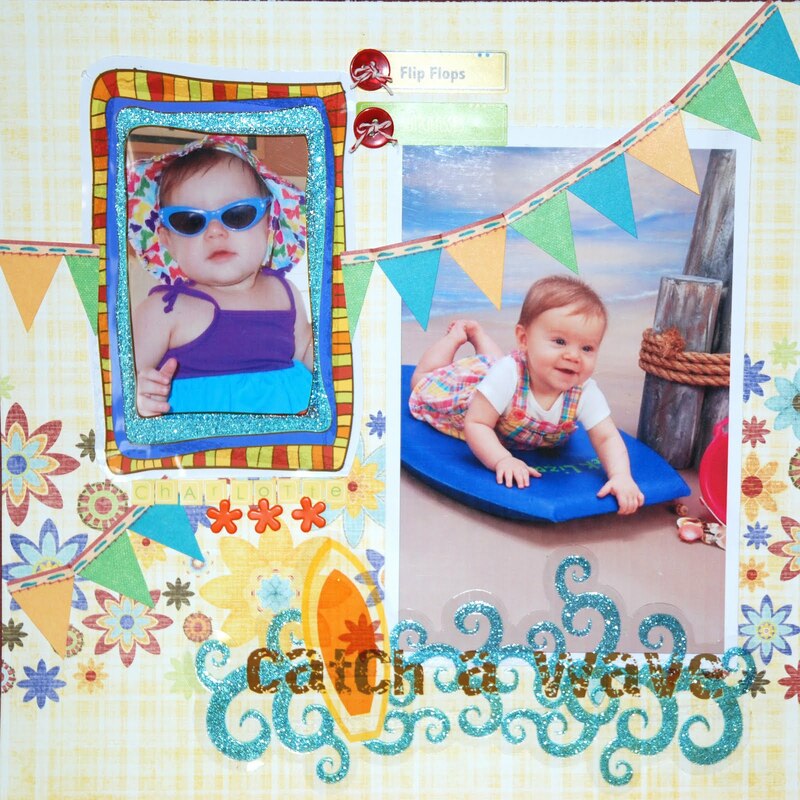 Cute layout only made perfect by that little one on the boogie board! I love this layout and Charlotte is just adorable. I want to be you when I grow up . Thanks for sharing your fantastic layout. You are just amazing. I love your work and you especially. :0) You are quickly becoming one of my favorite bloggy friends. I think it's so flattering that you posted my photo for the next stop. So sweet. Your granddaughter is stinkin' adorable!!! Love your layout too! She is adorable! Perfect papers for these pictures. Our Grandson was born 12-24 and he's a water bug too. We've already been to the pool this morning. Your granddaughter is adorable! I love your layout too! I love how you layered all the little details! I love it!!! It is so adorable! I like the look of the catch a wave. See My Cards Featured on Nikki's Blog! ALOHA! Hawaiian Themed Blog Hop 8/20 - 8/21. Still Coloring and Paper Piecing! The Opposite of a Fair Weather Friend? More Randomness: Another Oldie AND Goodie!